Browse through Lutron's & Mermet's extensive collections of window shade & drapery fabrics using each helpful comprehensive tool. Easily search for fabrics that meet specific shade parameters or find inspiration for your next project by looking through the photo galleries. For more options or if you have a custom fabric in mind, please contact your sales representative. Lutron collaborates with the world's leading textile mills to provide fabrics for all shade styles, giving high performance shades the beautiful and functional fabrics they deserve. 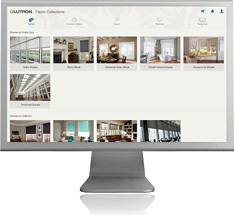 Use the following tools to browse the Lutron collection of shade fabrics, view photo galleries, and search for fabrics that meet the specific needs of your next project. Mermet has been a world-leading manufacturer of premium solar screen fabrics since 1976. With more than 40 years of experience mastering the engineering and design of sun control textiles, Mermet’s mission has always been to provide our customers with shading solutions that enhance solar protection, energy savings, durability, aesthetics, acoustical comfort and more.